Beautiful two level residential home located in South Kihei, Maui. The 3 larger bedrooms have their own private bathrooms. The 2 smaller bedrooms share the 4th guest bathroom. 2 living rooms. 2 car garage. This is South Kihei's newest vacation rental offering. Fully furnished with all the standard comforts of home. This home is very comfortable with 10 people (max). The office has a built-in dual station desk, complete with a Mac Mini with high speed Internet access, available for guest use. Ocean and Haleakala views including the island of Lanai & Kahoolawe from the wrap around patio & upper deck, which includes a BBQ, extra long dining table and seating area. 4 Flat Screen TVs, 3 AppleTV's w/ Netflix app, wireless Internet, cable TV, & an assortment of DVDs while you relax in Air Conditioned comfort or enjoy the island breezes. 4 of the 5 bedroom have ceiling fans. Beach chairs, cooler, boogie boards and snorkel gear provided. Just off the lower patio is a gazebo covering a 5 person Jacuzzi (425 gallon). The public pool is a 5 minute drive from the house. Owners are managers and live on Maui. We are happy to provide you with tips and information. This home has a huge solar system with battery backup, in case of a power outage. Many rental car companies are on the island. We have public transportation/bus system as well as many Uber drivers. We also provide 3 adult sized bicycles for cruising around Kihei. • Vehicles must be parked off the street on the driveway or inside the garage and cannot be parked on the street. • Guests are asked to remove their shoes before entering the house. • Because this is a residential neighborhood, there is no talking on the decks, patios or anywhere outside, after 8:45 PM. Neighbors are resting and their kids are sleeping or studying. This is prime rule #1. • No parties or group gatherings other than registered guests shall occur. • Guests bear the risk of any injury to themselves. • When driving, stay within the posted speed limit in the neighborhood. • Check-in is between 2:00 pm & 8:30 pm and check-out is 10 a.m. In consideration of the monies received and the mutual promises contained herein, the Owner (herein referred to as Manager) of the subject property hereby agrees to give a license to use the Property to the undersigned, (herein referred to as Guest), on the property and dates described on the reservation form and in the confirmation e-mail, under the conditions stated herein. Advance Payment: Guest agrees to pay Manager an Advance Payment in the amount specified on the reservation form and in confirmation e-mail. Advance payment is used to secure the property for advance reservations and is due at the time the reservation is made. Final Payment: Guest agrees to pay Manager the final payment on the date due and in the amount specified on the reservation form and in confirmation e-mail. Damage Deposit: Guest agrees to pay Manager a damage deposit in the amount specified on the reservation form and in the confirmation e-mail. Guest agrees to pay Manager the amount of actual damages to the Property arising from use of the Property, as well as for missing items, excessive clean-up and, if necessary, the cost incurred in removing Guest from the Property. Property Inspections: All problems, including inadequate cleaning and damage, must be reported by phone and email to Manager within 24 hours of check in for prior guest to be held responsible. Manager reserves the right to enter premises at any time for the purpose of effecting necessary inspections, repairs or maintenance. Notification: It is Guest's sole responsibility to inspect the Property upon arrival. In addition to inspecting the smoke detectors, Guest agrees to inspect the entire Property to ensure that it is free of hazards and properly equipped. Properties are not equipped for the elderly or handicapped. Guest assumes the entire risk of injuries arising from use of the Property. Guest will ensure that the Property has a secure shower or bathtub mat, and that the Guest takes reasonable measures to prevent slips in the bathroom, on staircases, steps, on balconies and throughout the Property. Guest agrees to take a higher degree of care in the use of the Property because of the age of the structures on the Property. Occupancy: The maximum number of occupants allowed in the Property is specified in the reservation. Children under the age of 4 are not counted. Overcrowding or misrepresentation is grounds for immediate revocation of the license to the Property and removal of Guest without refund. The Guest is the person who will occupy the Property. Parents may not book Properties for their children. The Guest must be present at the Property for the time of the reservation and take full responsibility for the Property. Small children are the responsibility of the Guest. Use the property and amenities at your own risk. Guest takes full responsibility for all lost or broken items and any damages to the Property of any kind. Restrictions on Property Use: Guests are prohibited from engaging in any unlawful activity or any other activity that constitutes a nuisance. Violation of this provision will result in immediate eviction without refund, and Guest will be held liable for any damages to the Property, contents and grounds. Personal Property Loss: Manager is not responsible for any loss or damages whatsoever due to the loss, theft or damage to Guest's personal property or to personal property owned by Guest's visitors including any vehicles whether owned, leased or rented. Subletting and Assignment: Guest may not sublet, sublicense or otherwise grant any rights to the Property. Property Use: The Property may not be used for any activity in violation of local, state or federal laws, or Hawaii Insurance rules and regulations. Limitations on Rental: Manager will not be liable for circumstances beyond their control, including but not limited to appliances or air-conditioning/heating failure, other mechanical failure, unfavorable weather, disruption of utility services including cable television, etc. There will be no relocation, rental pro-ration or refund in the event of such circumstances. In the event Manager is unable to deliver the Property to Guest because of property sale, property Manager decision, fire, mandatory evacuation, eminent domain or Acts of Nature, or if the property is unavailable because of construction delays or lack of utilities, Guest agrees that Manager's sole liability, as a result of any of these conditions, will be a full refund of all payments tendered by Guest. Guest expressly acknowledges that in no event will Manager be held liable for any other condition out of the control of the Manager, or for any incidental or consequential damages, including but not limited to, expenses that result from moving or for any other losses. Tenancy: The Guest acknowledges that this is NOT a tenancy for the Property. The Property is not rented for more than 30 days and is taxed and treated as a transient occupancy, akin to hotel accommodations. Property laws do not apply to the license granted herein, and the Guest may be removed as a trespasser immediately upon termination of this license. The Property is rented on regular short term periods and for a significantly higher rate than a non-vacation rental. Often a Guest is scheduled to begin a vacation in the Property on the same day as the checkout day of another prior Guest. If Guest stays even one additional day, Manager would face significant logistical problems with the next Guest, including possible liability. As such, Guest agrees to vacate immediately on the checkout day by 10:00 a.m. Failure to do so will entitle Manager, in addition to all other remedies available to it, to have Guest ejected by law enforcement as trespasser and to physically remove Guest and all of Guest's possessions from the Property (for which Guest hereby grants permission and consent) and obtain damages and injunctive relief against Guest. If the property is not rented to another guest on the same day, you may request a late checkout and we usually can accomodate your request. Indemnification: Guest agrees to release Manager from and against all liability should anyone be injured upon the premises during the term of occupancy resulting from any cause whatsoever, except in the case of personal injury caused by willful gross negligence on the part of the Manager. Governing Law: The terms and conditions stated herein will be interpreted by and governed under the laws of the State of Hawaii and any action arising out of this agreement shall be litigated in the State of Hawaii. Grew up in the Bay Area. My family moved to Maui in 1989. My wife and two kids still live full-time on Maui. I am a Solar PV Contractor and love to Mountain Bike, Surf, Boat, Ski, Help People and spend time with my kids. We lived in this home for 12 years. 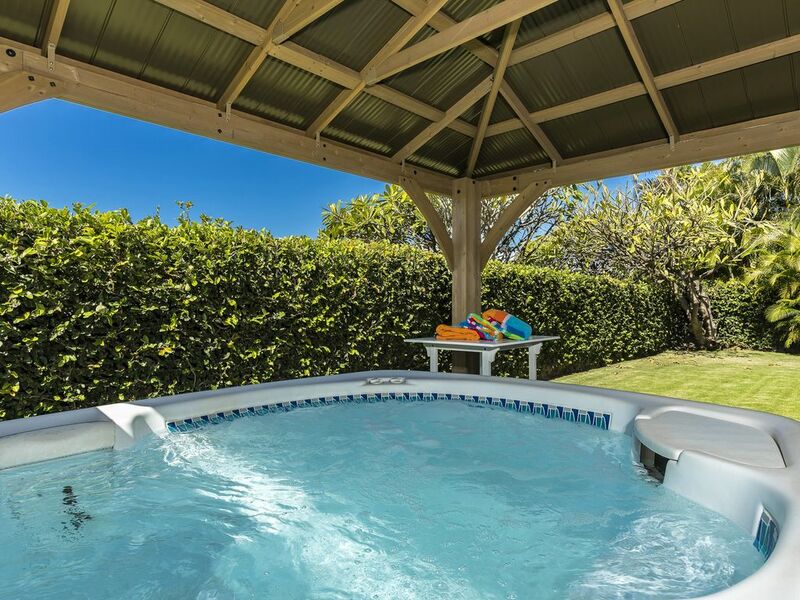 We chose it because it is located in the best part of Kihei, on a culdesac. The best School District and because of it's proximity to Maui's best beaches and the Kihei Boat Ramp. When we first walked through this house, we immediatley fell in love with the ocean & mountain views. The large 500sf wrap around upper deck is fantastic and is only second to the same sized lower patio, directly below. The additional gazebo, housing the jacuzzi, makes for a huge amount of outdoor living space. It is a 10 minute walk to Kamaole III Beach Park. Fantastic restaurants and boutique shopping malls are a just a few more minutes walking distance. 10 minute walk to one of Maui's best beaches. Views of Haleakala and the islands of Lanai and Kooholawe. From the rear upper deck, you can see the ocean with Lanai and Kooholawe islands. Central Air upstairs. Split AC downstairs. Parking in Garage and overflow on side of house and in the driveway. Both ethernet and Wifi connection available. Mac Mini with LED Flatscreen available for guest use. Two refrigerators. One in the upstairs Kitchen. Second refrigerator downstairs in garage. Kitchen is fully stocked with dishes, silverware, pots & pans, spices and everything you would expect in a kitchen. This includes a oven/range, microwave, coffee maker, toaster, blender, etc. Additional Dining inside for 6 more people. 5 Flat screens, 3 with Apple TV's, one with a built-in DVD player. Upstairs Living Room has Flat Screen TV with built-in DVD player. Good size selection of DVD movies. Bring your AppleTV login or Netflix login to access your own account. Boat Rentals from SeaEscape Boat rentals, only minutes away. Tandem Kayak, Snorkel Gear, Boogie Boards, BeachChairs and Cooler provided. Free Public Tennis courts available only 5 minutes away at Kalama Park. World class golfing only minutes away. Free public pool only 5 minutes away at the Kihei Aquatic Center. The house was great. Only minor issues: The hot tub was more like a warm tub. We had some difficulty figuring out how to use the TVs. Otherwise, everything was great! It is a fantastic house for a large group with 5 bedrooms and 4 bathrooms. If I could give it 4 and 1/2 stars, I would. It would need to be closer to the beach, and with a better view of the ocean to achieve 5 stars. The place is exactly as described and as amazing as all the reviews we read. Check in was easy and Darryl came to meet us to show us tips and tricks around the house, which is always nice for a hoat to do. House extremely clean! We had two young families and grandparents for this visit. The house is spacious and we liked that we could each have our own space to retreat to. The amenities to go to the beach were fantasric: beach toys, body boards, towels, snorkel gear, chairs, and huge cooler. It was a great set up as these were all in the garage, so packing/unpacking was a breeze. We parked our cars in the driveway and loaded/unloaded onto the garage. This kept all the sand out of the house. We barbecued all our meals and ate most of our meals on the deck. The only unfortunate part was when we ran out of propane and the spare was also empty but Darryl very quick to remedy this. Otherwise, kitchen utensils, pots and pans, and BBQ were great. There were even plastic cup, plates, bowls for the kids. We found a high chair to use as well for our 11 month old, so that was a big plus. Would stay again at Darryl's place in a heartbeat. Thank you for the lovely accommodations, everybody was very comfortable with their stay. 7 members of our family were sharing this house.There never was a problem and we enjoyed all the amenities.We really appreciated being able to live in such a pleasant environment.It's an ideal house for a large number of adults thanks to a good number of bathrooms.We really liked the neighborhood which was quiet,residential and very well kept.It is far enough from the beach and its attractions but not so far to be a problem. Mahalo Daryl for sharing your house. Stayed in Daryl's beautiful, spacious place in Kihei for a reunion of friends, and absolutely loved it. The very comfortable beds, well equipped kitchen and amazing ocean view deck really helped us relax and live aloha during our stay. Daryl's place also has easy access to great beaches and restaurants in Kihei, and is easy to get to from the airport and most of Maui. We'd come back in a heartbeat. Daryls’s home is a wonderful place for a group to stay while on vacation to Maui. It is close to beaches, restaurants and shopping. The home itself is just lovely...we spent every morning over coffee watching the whales in the distance! Everything is provided that you could possibly need- from beuatiful clean linens to the best equipped kitchen I have seen in a vacation home. We can’t say enough about Daryl’s home and his help! We had a few questions which he answered so quickly! What a great host- thank you for sharing your home with us! Overall, our family had a wonderful reunion experience at this home. Everyone had their own bedroom--a real plus, as often individuals wanted to rest, retreat and do some work or just "chill" (the pre-teen in our group!). Daryl was also a generous host who allowed us to check in early and check out late. We were very grateful for that as we had to coordinated multiple arrival and departure flights. The house is not fancy or elegantly decorated, but all furniture was comfortable, clean, well-maintained, and suitable for a large family. The balcony dining table could easily seat eight and we loved enjoying evening meals together. And there is a peek at the ocean for this balcony. The kitchen is nice and for the most part well-equipped. A large salad bowl would have been appreciated! Outstanding large barbecue conveniently located on the deck near the dining table. The house is also very well-stocked with everything you will need for fun at the beach--chairs, towels, boogie boards, snorkel gear, sand toys, etc. etc. Just bring yourselves and have a good time. We also loved the ping-pong table in the garage. All of that said, I will say that the beds tend to be very soft--all mattresses topped with soft foam. This gave my back some problems, but other family members thought they were fine. Also, at this price point, some houses offer private swimming pools--would have really loved that. You can walk to the beach, but it is too far to walk if you carry beach equipment. So be advised. The area is quiet and filled with lovely homes--away from the hub-bub of Kihei beachfront. All in all, we had a lovely stay. Rate applies up to 10 guests. Cancellation Policy: A 25% cancellation fee will be applied to all reservations. For cancellations received within 90 days or after arrival date, all payments will be retained. If the subject property can be re-rented, a pro-rated refund will be issued less a 25% cancellation fee.